After 30 hours of travel from the US to Punta Arenas, Chile, and then a four-day transit on R/V Laurence M. Gould across the Drake Passage, Marie Zahn and Anna Bashkirova representing the Schofield team arrived on October 6th, 2018 to Palmer Station. 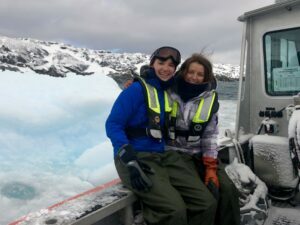 Marie Zahn (left) and Anna Bashkirova (right) aboard RHIB Hadar. Typically foul weather conditions inhibit early season sampling, but this year’s open water and manageable winds allowed us to completely capture the first spring phytoplankton bloom, peaking around November 19th. Wind speed decreased after the first week of November and sea ice retreated, allowing sufficient sunlight and water column stratification for a bloom. 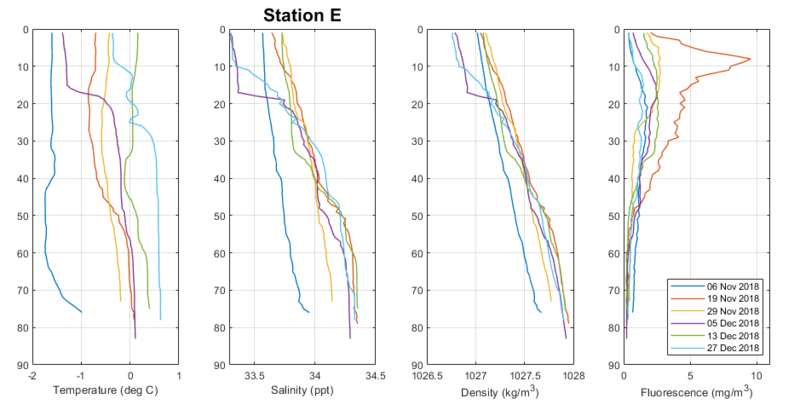 Stratification was especially pronounced November 15-19 and best observable in salinity and density values from CTD profiles collected at two locations: Stations B (nearshore) and E (offshore). This was accompanied by a steady rise in fluorescence, primary production, and chlorophyll concentrations, all three reaching a peak on November 19th. Strong winds beginning November 18th soon mixed the water column, quenching the bloom. 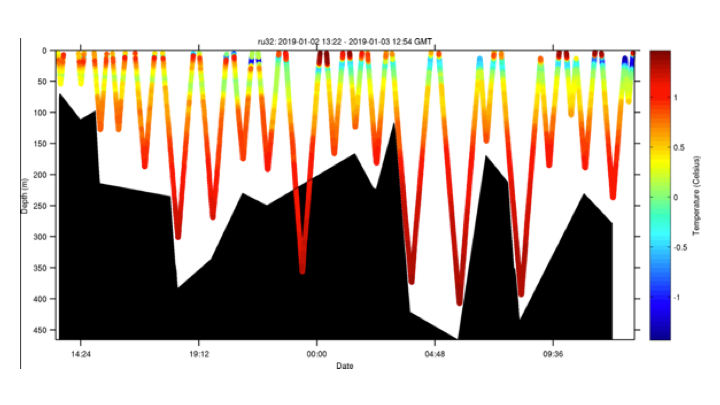 Our measurements of primary production (mg C/m2/day) and chlorophyll concentrations (mg/m2) dropped down after the spring bloom and have remained steady since. 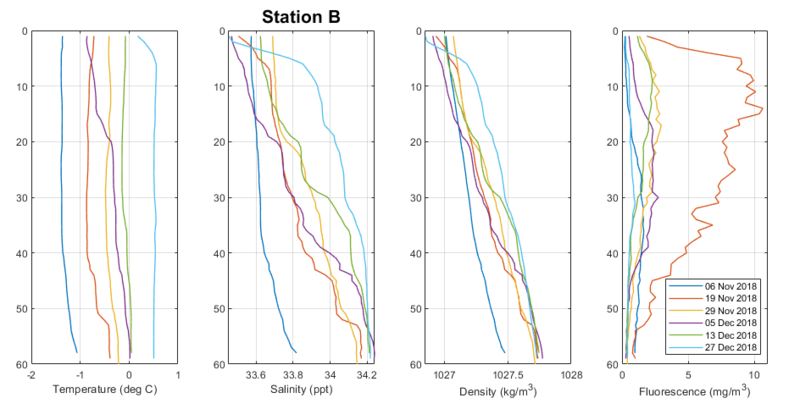 Fluorescence profiles also reflect the spring bloom (reaching nearly 10 mg/m3 at the chlorophyll maximum) and subsequent leveling-off to ~3 mg/m3 for both Stations B and E.
Temperature (˚C), salinity (ppt), density (kg m-3), and fluorescence (mg m-3) profiles against depth in meters (L-R) for six November and December 2018 sampling events at Station B (top row) and Station E (bottom row). 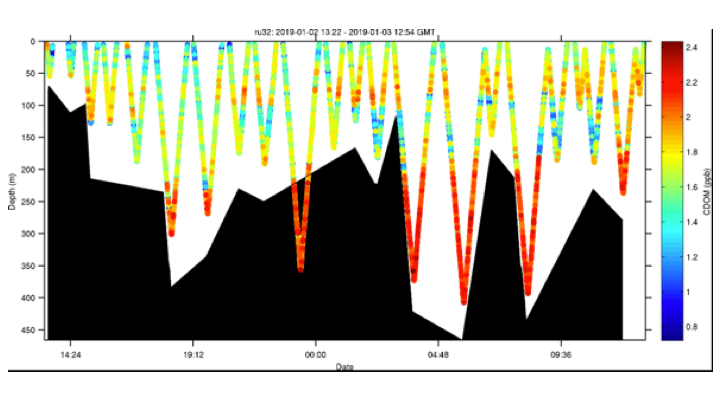 Depth-integrated primary production (mg C/m2/day) values from Station B (blue) and Station E (orange) for November and December 2018. Depth-integrated chlorophyll (mg/m2) values from Station B (blue) and Station E (orange) for November and December 2018. 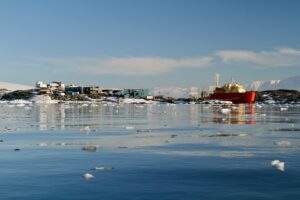 The 27th Annual research cruise of the Palmer Long Term Ecological Research (LTER) (www.pal.lternet.edu) along the Western Antarctic Peninsula set sail on January 5, 2019 and will continue until February 7, 2019. The LTER annual cruise will be surveying the Western Antarctic Peninsula, studying the entire food web – from phytoplankton and bacteria to krill and other zooplankton to whales and penguins – working to understand the changing ecosystem and the influences climate change is having along the peninsula. The Palmer Station component of the LTER project, also in its 27th year, also adds a seasonal scale to the study, running from October 2018 to April 2019. 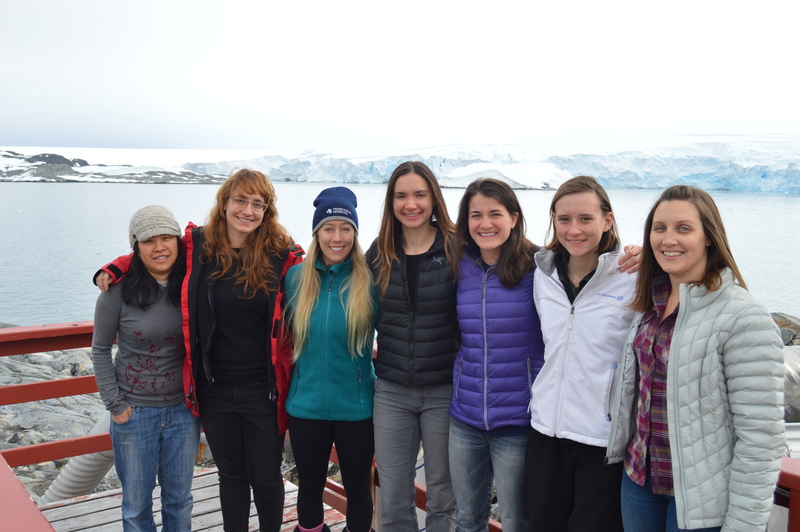 This season, the phytoplankton component of the Palmer LTER, headed by Dr. Oscar Schofield, has an all female field team! Led by Field Team Lead, Nicole Waite (RUCOOL Technician), team members include: Dr. Kim Thamatrakoln (DMCS Assistant Research Professor), Emily Slesinger (RUCOOL graduate student), Samantha Schofield (Rutgers undergraduate student), and Hailey Conrad (Rutgers undergraduate student). 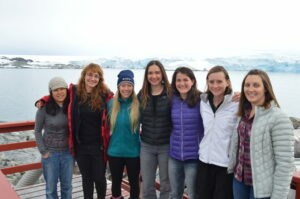 The Palmer Station field team is lead by Schuyler Nardelli (RUCOOL graduate student) who is also doing her dissertation research with the Palmer LTER and Marie Zahn (field technician). Not pictured, Anna Bashkirova (Rutgers undergraduate) was also a key member of the field team at Palmer Station from October to December 2018. Weather cooperated and the LTER team was able to launch a glider this Wednesday offshore Palmer Station. Hopefully the ice will cooperate and we maintain a sustained presence for the rest of the summer season. The glider this year is outfitted with a SeaBird CTD, WetLabs fluorometer and optical backscatter sensor. The glider is also carrying a ASL Environmental Sciences multifrequency acoustic system to measure zooplankton and fish. The goal of this years mission is to measure the variability of phytoplankton, zooplankton, and fish distributions and their relationship to penguins and whales. Currently the glider is transecting back and forth along the head of the Palmer Deep canyon. 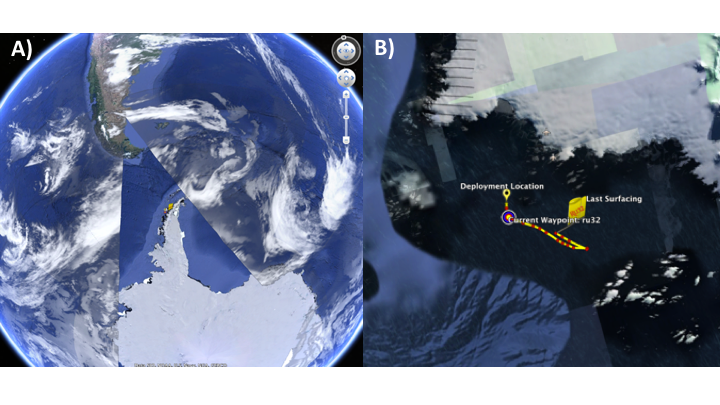 Below is the glider location along the WAP (A) and the a zoom-in showing its movements near palmer station over the last 24 hours (B). The figure below is the cross section of the water temperature. The black shapes is the “estimated sea floor” as measured by the onboard glider altimeter. The altimeter is obviously giving some false bottoms, as the glider is transecting deeper the altimeter derived sea floor. This has been seen before, and our working hypothesis is the altimeter is getting returns on large krill swarms not the seafloor. The AZFP will provide insight on this. Temperatures show a typical range for this location, with warm water at the surface (presumably reflecting radiant heating) and at depth reflecting remnant modified circumpolar deep water. 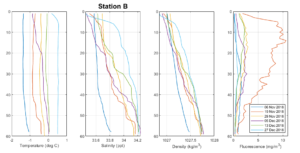 A cooler layer at 30-50 meter water depth probably reflects residual cold surface water. The salinity shows a fresher surface layer with a salinity at 33 to 33.2. This likely reflects sea ice and glacial melt. Chlorophyll fluorescence shows a surface bloom at the eastern portion of the transect indicating a moderately sized phytoplankton bloom. 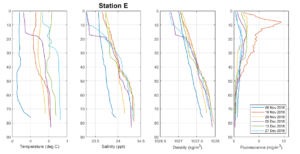 Optical backscatter shows no strong correlation with the surface phytoplankton. However there does appear to be particles at depth which could be consistent with export flux events with the material potentially ranging from marine snow to animal poop. Finally Colored Dissolved Organic Matter (CDOM) shows significant variability, however the deep modified circumpolar deep waters are distinct with a high fraction of fluorescent CDOM. Palmer Station and ASRV Laurence M. Gould docked at the pier. Photo by Marie Zahn, summer 2018. Welcome to the RUCOOL Polar Oceans blog! Here we will share updates from our research conducted along the West Antarctic Peninsula (WAP) from Palmer Station and while aboard the R/V Laurence M. Gould. Our research contributes to the Palmer Long-Term Ecological Research (LTER) program (https://pal.lternet.edu) that monitors decadal ecological changes of the pelagic marine ecosystem along the WAP. The Palmer LTER program was established by the National Science Foundation in 1990 and combines efforts from several universities to examine the whole food web from bacteria to seabirds and cetaceans. Our research objectives are to understand seasonal and interannual patterns and changes in the phytoplankton as well as the physical properties (temperature, salinity, and light) that affect them, especially as this region warms and shifts from a true Antarctic ecosystem to a more sub-Antarctic one. More specifically, we focus on how the physics and nutrient availability drive overall carbon fixation in the upper ocean and how that relates to higher trophic levels. Our routine analyses include discrete chlorophyll a measurements, 14C uptake to determine primary productivity, chemotaxonomic pigments via high performance liquid chromatography, fluorescence induction and relaxation kinetics, and whole water carbon fixation rates. We compliment these measurements with water column bio-optical profiles. This austral summer marks our eleventh season at Palmer Station. Already it has been a productive one (pun-intended). Stay tuned for more updates and posts as we go deeper into some of our protocols and recent findings from our research here in Antarctica!